We’d love your help. Let us know what’s wrong with this preview of A Pocket Guide to the Craft of Words, Part 1 - Macrocopy by Christopher Murphy. Look carefully and you'll notice that many of the most successful designs are built around words. Apple tantalises us with the ability to hold "1,000 songs in your pocket". MailChimp has created a wonderfully engaging brand, heavily focused around language. Words lie at the heart of what we create as designers and an understanding of how they might be used will make you bet Look carefully and you'll notice that many of the most successful designs are built around words. Apple tantalises us with the ability to hold "1,000 songs in your pocket". MailChimp has created a wonderfully engaging brand, heavily focused around language. Words lie at the heart of what we create as designers and an understanding of how they might be used will make you better at your craft. Just like an understanding of grid systems, colour theory and typography are essential for the practicing designer, we must take responsibility for the words that make up the content we shape. In this book The Standardistas demonstrate how a respect for the craft of words can lead to better and more engaging user experiences and add an often overlooked, but important element, to your design toolbox. If you're a designer working with content, this book is for you. The principles we cover extend beyond the screen and can be applied in a wider design context to improve communication as a central part of the design process. Words are an often overlooked design element that, when used effectively, can transform our perception of a brand. In this section, we'll explore how an awareness of words and language can make you a better designer, helping you to define and shape the messages you craft. Establishing a tone and considering the importance of voice is critical when creating a brand persona. By understanding a brand's values we can give that brand a voice that's appropriate and fits it like a well-tailored suit. In this section we consider a series of case studies – Hiut Denim, GitHub and GOV.UK – exploring how they use words as a design element to help clearly shape and define their brands. Whatever your message, you need to ensure you communicate it correctly. In this section we suggest a few resources - both on and offline – to help you master the craft of words. To ask other readers questions about A Pocket Guide to the Craft of Words, Part 1 - Macrocopy, please sign up. It’s really short and accessible which will be great for the future but it didn’t feel long enough for me to thoroughly enjoy it - ironic! A great basic reminder guide to using words as a critical element of design and messaging: an overview of voice, tone, and clear language. 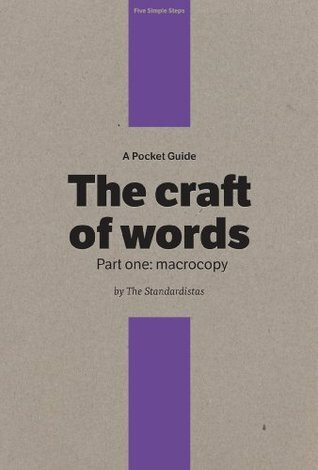 Goes together with A Pocket Guide to the Craft of Words, Part 2 - Microcopy. A short, accessible, persuasive cry for designers to invest in the writing that makes up the essence of their field.